Navdanya is movement based on networks and partnerships from local to the global level. Prakruti Paramparik Bihana Sangharakshana Abhijan, Orissa, Jharkhand Alternative Development Forum, Women's Alliance, Ladakh, Sirmaur Farmers Association, Himachal Pradesh, Vidharbha Jan Andolan Samiti, Green Foundation, Beej Bachao Andolan, CIKS, Navdarshanam, Appiko, Vrihi Bija Binimoy Kendra, West Bengal, Manvi Seva Sansthan, U.P., Gram Swaraj Prahari, U.P., Parisaran Samvrakshana Kendra, Manvi, Jharkhand and Bihar, Deshma Sikshan Sansthan, Rajasthan, Agricultural Renewal in India for Sustainable Environment (ARISE), Tamilnadu Organic Farmers Association, Vidarbha Organic Farmers Association, Art of Living, His Holiness Delai Lama “Tibetan Government in Exile, Dharamshala, H.P., Janhit Foundation, Kheti Virasat, Centre for Interdisciplinary Studies, Annapoorna, Vishal Udyogik Krishi Vikas Sansthan, Bihar, INTACH and Others. Grassroots farmers’ organisations like BKU, BKS, Andhra Pradesh Ryotha Sangha, Chattisgarh Mukti Morcha, Paschim Orissa Krishi Jeevi Sangh, Orissa Krishak Mahasabha, AIKS, Mass organisations such as AIAWU, AICCTU, AIIEA, AIRF, AITUR, AIYL, BKMU, CITU, FAIRCS, NCOA, NFF, NWGPL, NAWFR, All India Kisan Sabhas, Agragami Kisan Sabha, Bharat Krishak Samaj, Bhartiya Kisan Union (Ambavat), Bharatiya Kisan Sangh, Akhil Bharatiya Khet Majdoor Union, Samyukta Kisan Sabha, Karnataka Rajya Ryot Sangha (KRRS), Karnataka Farmer's Association, Bhartiya Kissan Union (Non-Political), BKU Ekta . Diverse Women for Diversity, National Alliance of Women Food Rights, Women's Alliance, Ladakh, All India Women's Conference, Azadi Bachao Andolan, National Commission for Women, Kali for Women/ women Unlimited, Vimochana, All India Democratic Women’s Association, National Federation of Indian Women, Shtrii Shakti, Mahila Samakhya, Tapovan, Sanyo-Ka-Sangathan, Ladakh Women’s Alliance, SANGAT, The National Democratic Women’s Alliance, Jagori, Sabla Sangh, Ankur, FORCES, Indian Social Forum and National Commission for Women, the Women and Biodiversity Network of the region of Tuscany and Others. Exposure on Organic Farming and Biodiversity Conservation, Indigenous knowledge is given to more than 50, 000 school kids across the country. School kids have also been part of Navdanya programmes like Sagwadi, Good Food for All, Little Chef and Community Biodiversity Register for documentation of Indigenous knowledge about biodiversity. Research Foundation for Science, Technology and Ecology, Gandhi Peace Foundation, Council for Social Development, Greenpeace, Development Alternatives, Toxics Link, the Other Media, Indian Social Institute, Institute of Social Sciences, Multiple Action Research Group, INTACH, Action for Food Production, National Productivity Council, Animal Rights International, National Alliance of People's Movement, Bharat Jan Andolan, Indian Peoples Campaign Against WTO, Deccan Development Society, Centre for Science and Environment Tamil Nadu Gram Swaraj Movement, Bombay Natural Society, KSSP, Centre for Environment and Communication, NBF, SETU, KFIRV, Sanctuary and Others. About 2,500 NGOs across the country including Sambhav, Deccan Development Society, Agrarian Assistance Association, Centre for Youth and Social Development, Vikas, SANHATI, Manav Kalyan Trust, Vigyan Shiksha Kendra, Jan Jagaran Samiti, Antodaya, CIS, Dharamitra, Ekta Parishad, Seva, Jatan, Sarbik Gram Bikas Kendra, Rupantar, URMAL, Action, Artic, Samparc who have been brought together by Navdanya and the Research Foundation into a national food rights alliance and the Bija Satyagraha. Ashraya Adhikar Abhiyan, Prayas, Raffel Homes, Family of Disabled etc. National networks such as the National Working Group on Patent Laws, Indian Peoples Campaign Against WTO (IPCAWTO), Azadi Bachao Andolan, All India Drug Action Network, People’s Health Network, ARISE, Lok Shakti Abhiyan, Sarva Seva Sangh, Rashtriya Yuvak Sangh, NAPM, Samajwadi Abhiyan, Lawyers’ Collective, Our World is Not for Sale (OWINS), International Forum on Globalisation, Third World Network. The Land Sovereignty partners include Sri S.P. Shukla, Former Ambassador GATT, Mr. Abhani Roy, Member of Parliament, the Taj Mission, Nandigram, KRRS, Lokshakti Abhiyan, Bharat Kisan Union, Adivasi Kranti Sangathan, Rashtriya Yuva Sangathan, Haryana Kisan Mazdoor Sangarsh Samiti etc. Tarun Bharat Sangh, INTACH, Paani Morcha, PWWF and Jal Board Employees Union, Bharat Jagriti Mission Nyas, Uttarakhand, Jal Prahari, Yamuna Satyagraha, Plachimada Movement against Coca Cola, Coke Pepsi Free Campaign, Azadi Bachao Aandolan, Waterkeepers Alliance, Water Warriors Network, Council of Canadians, Polaris Institute, Food and Water Watch, Global Water contract. Parliamentary groups of all political parties including CPI, CPM, Forward Block, Revolution Socialist Party, Jan Morcha, Congress I, BJP, Samata, Samajwadi, Janta Party etc. Partners in responding to the threat of mega retail like Walmart and Reliance are All India Association of Traders, National Association of Hawkers, FDI Watch and Trade Unions. International Organizations: Third World Network, Gaia Foundation, Schumacher College, Institute for Sustainable Development, Ethiopia, International Forum on Globalisation (IFG), OWINFS, Slow Food International, Center for Food Safety, IFOAM, Diverse Women for Diversity, Waterkeepers Alliance, Women’s Environment and Development Orgnisation, World Social Forum, Via Campesina, People’s World Water Movement, International Commission on the Future of Food, FAO, Peasant Movement of the Philippines, Terre des homes, IBON Foundation Inc., UBINIG (Bangladesh), Focus on the Global South, CAP (Malaysia), Project of Ecological Recovery, PAN Indonesia, ETC Group, Food First, Small Planet Institute and many Others. Navdanya has trained Secretaries and Agriculture Extension Officers of the secretariat of His Holiness Dalai Lama, in Dharamshala from their secretariat as well as from their 45 major settlements across India in Biodiversity Conservation and organic farming. The training includes lectures as well as hands on training on different techniques of composting including vermicompost and improving soil fertility, biological pest management; cultivation of medicinal plants and Agro forestry etc. Navdanya is Advisor to the Tibetan Government in Exile in their endeavor to promote and convert the land of Tibetan farmers to organic, who otherwise were involved in conventional farming. The other important aspect of this project is to create a Seed Bank in their settlements in different parts of India. The goal of which is not only to conserve the local varieties but also the indigenous as well as endangered seed varieties of the Tibetan plateau, which are currently under serious threat of extinction under Chinese occupation. The Tibetan government in exile is also a partner in Navdanya's research and campaign on climate change in Himalaya. Prime Minister of Tibetan Govt. in Exile, Professor Samdhong Rinpoche continues to be one of the faculties in a Course ‘Gandhi and Globalisation’, held annually in November-December every year. In the year 2004 Dr. Vandana Shiva and Professor Samdhong Rinpoche also launched the Noodles and Pasta made by the group of Tibetan refugees living in Dehradun. 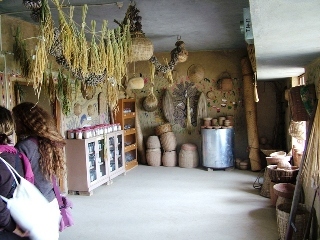 avdanya is a network of seed keepers and organic producers spread across 16 states in India. Navdanya has helped set up 54 community seed banks across the country, trained over 500,000 farmers in seed sovereignty, food sovereignty and sustainable agriculture over the past two decades, and helped setup the largest direct marketing, fair trade organic network in the country. Navdanya has also set up a learning center, Bija Vidyapeeth (School of the Seed) on its biodiversity conservation and organic farm in Doon Valley, Uttranchal, north India. 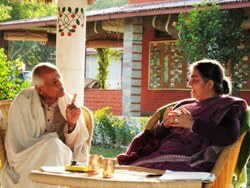 Navdanya is actively involved in the rejuvenation of indigenous knowledge and culture. It has created awareness on the hazards of genetic engineering, defended people's knowledge from biopiracy and food rights in the face of globalisation and climate change. 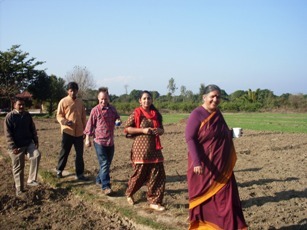 Navdanya is a women centred movement for the protection of biological and cultural diversity. • Founded in 1987 by Dr Vandana Shiva, Seed saving movement started in Karnatak and Tehri Garhwal. • Registered as trust in 1991. Community seed banks established in Henwal Ghati Tehri Garhwal (Beej Bacho Andolan) Talli (Karnataka / Tamilnadu) which later became the Green Foundation. Sirsi Karnataka (APICO-Parisar Sanrakshan Kendra). • 1993 – Rally of 500,000 farmers from India and abroad gathered in Bangalore against GAAT which became WTO. • 1998 - Legal challenge to Monsanto’s illegal GMO Bt. Cotton. • 2005 –World Bank driven water privatization project in Delhi by Suez was closed down. Funding supoort has been difficult as the issues that are worked on are not that popular. Certain issues which are not mainstream and against the so called development that India is following we have expereinced physical violence. 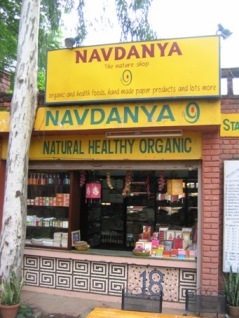 Navdanya’s mission is to promote peace and harmony, justice and sustainability. We strive to achieve these goals through the conservation, renewal and rejuvenation of the gifts of biodiversity we have received from nature and our ancestors, and to defend these gifts as commons. The setting up of community seed banks is central to our mission of regenerating nature’s and peoples wealth. Keeping seeds, biodivdersity and traditional knowledge in people’s hands to generate livelihoods and provide basic needs is our core programme for removal of poverty. Navdanya’s mission focuses on improving the well being of small and marginalized rural producers through non violent biodiverse organic farming and fair trade. Biodiverse organic farming produces more food and nutrition and brings higher incomes to farmers than monocultures and chemical farming. While avoiding environmental harm, biodiverse organic farming is also an insurance in times of climate change. Our vision of Earth Democracy is translated into a mission of creating biodiversity and seed sovereignty, food sovereignty and water democracy. The defense of seed, food and water sovereignty (Bija Swaraj, Anna Swaraj, Jal Swaraj) is necessary for fulfilling our mission of bringing prosperity to communities of small agricultural producers thus sowing the seeds of peace and prosperity. We are therefore committed to resist patents on seeds and life forms promoted by the TRIPS agreement of WTO which lead to the privatization of biodiversity and piracy of traditional knowledge (Bija Satyagraha). We have successfully challenged biopiracy patents on neem, basmati and wheat. We are building the living democracy movement “Jaiv Panchayat” to defend biodiversity as a commons. We are committed to promoting alternatives to non-sustainable agricultural technologies based on toxic chemicals and genetic engineering. We are committed to changing the rules of unfair trade force on small peasants through the WTO Agreement on Agriculture, which are leading to destitution, debt and farmers suicides. Our mission is to create living economies based on living democracy, with producers and consumers shaping their food cultures through participation and partnerships through cooperation and caring. Our mission is to promote organic fair trade, based on fairness to the earth and all her species, fairness to producers and fairness to consumers. We will expand our network of outlets and cafes to create another food culture, which respects diversity, local production and food quality. In partnership with similar movements like The Commission on the Future of Food and Slow Food, we are committed to creating a future of food and agriculture in which small farmers prosper and biodiversity and cultural diversity thrives. Biodiverse small organic farms increase productivity, improve rural incomes and strengthen ecological security. Large-scale industrial monocultures displace and dispossess small farmers and peasants, destroy the environment and create malnutrition and public health hazards. Our mission is to provide alternatives to a global food system, which is denying one billion people access to food, and denying another 1.7 billion the right to healthy food, as they become victims of obesity and related diseases. Our mission is to provide “good food for all” through the promotion of biodiverse organic farming, food literacy and fair trade. We work with children so that future generations grow up healthy and free of disease, they can make informed food choices. With school children and street children we design “little Chefs” programmes to create a culture of taste, quality, health and nutrition among our little ones. Our mission is to keep food security in women’s hands through our network of women’s producer groups (Mahila Anna Swaraj). Women are the custodians of biodiversity, the providers of food security, the preservers and processors of food, the conservers of the cultural diversity of food traditions. The future of food depends on keeping women’s food knowledge and expertise alive. That is why our movement “Diverse Women for Diversity” is at the heart of our mission for the protection of biological and cultural diversity. Our mission is to meet peoples needs while protecting the earth, defending our ecological and intellectual heritage, and strengthen livelihood and food security. By dialogue and creating spaces where these ideas and action can be shared we can stregthen this movement. Promotion of non-violent practices of producing food.